Joey - Available for Adoption! 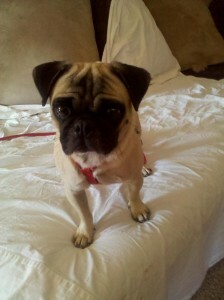 Joey is a 4 year old fawn pug from an owner surrender. Joey has escaped from the foster home twice and is quite a little Houdini. You must have a great fence and probably need to keep a good eye on this little guy because he could give you quite a panic attack. 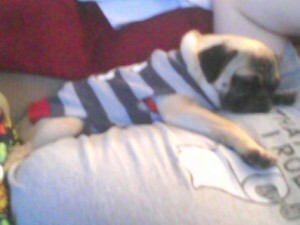 Other then his Houdini skills he is a warm snuggly, sweet pug. Exactly what is the radius/mile from which people can adopt pugs from your area? We live in the Quad-Cities Illinois/Iowa area. It is about that 10 mile radius or so where you can cross the bridge and go into Davenport, Iowa or into Moline, Illlinois w/a hop, skip or a jump. We are looking are getting another pug here shortly and already have two pugs that we rescued from a puppy mill called Maude & Cheyanne almost 6 years ago. They are older pugs at ages 12 & 13 now – but they are still our babies! We are just curious what the process would entail because we decided that if we ever got another pug it was a MUST that it had to be rescued! So, any information on how to go about that would be great!